DYF participants meet the hydrogen fuel cell vehicle. 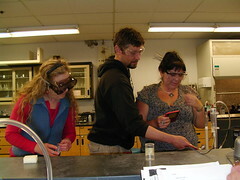 The second followup for the DYF Teacher Institute II occurred on May 23, 2010 from 8am- 4pm at Humboldt State University. Links to the materials provided at the institute are available below. Seven DYF teachers attended Brooks Franklin, Byron Giese, Dave Haller, Ellen Osten, Maggie Peters, Rebecca Schuler, Forrest Stamper. The instructors were Jim Zoellick of the Schatz Energy Research Center and Beth Eschenbach of Environmental Resources Engineering at HSU. Teachers took home their own Kill-A-Watt meter, a box of Engineering Go For It magazines, and Engineer Your Life brochures. In the morning Beth shared information from HSU’s 2010 Institute for Diversity in Learning and Teaching. The group reviewed demographics of the US and compared those demographics to the current demographics of the Science and Engineering (S&E) workforce. We noted that, although the diversity of the S&E workforce has increased over the years, it still does not reflect the diversity of our nation. In addition, we learned that the average 12th grade student is not meeting the Basic level of National Assessment of Educational Preparedness science assessment, with underrepresented minorities consistently scoring lower than white and Asian students. Ellen, Brooks and Maggie work with a HyTEC fuel cell kit. We then considered the idea of developing a “Scientific Temper”, a term which was used by India’s Prime Minister Nehru in the 1950’s and brought into the conversation of science education by Editor-in-chief Science magazine Bruce Alberts. Alberts points out that much excellent hands-on K-12 curriculum exists, but our current testing paradigm does not support excellent science education. Alberts calls for using a new approach for fostering excellence and innovation in science education; an approach seen in industry and science. In particular, he calls for a paradigm shift, similar to that seen in the US auto industry 40 years ago, where excellent teachers would join those who lead education reform. Alberts also suggests we apply our best understanding of how people learn and how people learn history, math and and science into the classroom. This work is summarized on the National Academies of Press website and can be downloaded at no cost. The last part of the conversation was based on Ken Bain‘s presentation and focused on how to inspire students to use deep learning approaches instead of surface or strategic learning approaches. We ended with thinking about what kinds of “hooks” teachers can use to tie standards based curriculum to questions our students find “important, intriguing or beautiful”. We wondered if the NAE Grand Challenges for Engineering could be seen as important, intriguing or beautiful to secondary science and math students. Possibly the 5-Part Make It Happen Plan outlined on the NAE Grand Challenges K12 Partners Program site could be used to create links from existing curricula to the NAE Grand Challenges. As we discussed ideas, we shared some favorite books and websites: Cadillac Desert, Monkey Wrench Gang, Physics by Inquiry and Google physics. 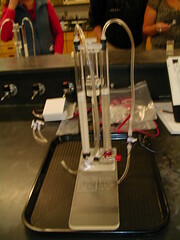 HyTEC Electrolizer and Fuel Cell Kit. Sets of 8 kits are available for check out from SERC. Brooks shared information from the workshop he had attended on Career and Technical Education (CTE) and Mathematics. The approach suggested starting with a typical CTE situation then present similar CTE situations and then, only then present the “naked math”. They focused on linking existing curriculua to CTE. Brooks also shared a video presented at the workshop. This version is still funny, but a little longer. Multiple times the conversation touched on the difficulties of teaching hands-on curriculum in a setting that is driven by high stakes testing. Jim joined the group a little after 10am as we were talking about “hooks” for secondary science and math students. Jim provided an overview of the Schatz Energy Research Center’s involvement a project sponsored by the California Energy Commission to study Humboldt County’s potential to rely on renewable energy in the future. 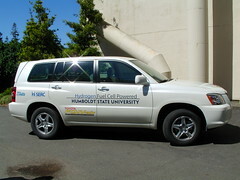 Hydrogen fuel cell powered vehicle available to visit schools in Humboldt County. We went outside to see the hydrogen fuel cell powered vehicle. request SERC would provide the KOH required for the electrolizer. 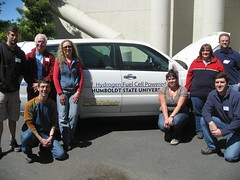 bring students to HSU and visit the hydrogen fueling station. Byron had the kits mailed to his school. He told Jim how he changed the kits and the handouts when working with this students, since the kits had arrived missing a few tubes. Jim learned the kits are more flexible than imagined. 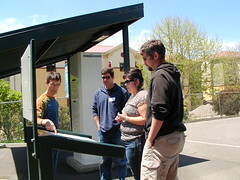 Jim shows Dave, Maggie and Brooks the HSU hydrogen fueling station. K12 students and teachers are welcome to come to campus for similar tours. During lunch Jim took participants on rides in the fuel cell vehicle. DYF teachers provided input for this summer’s institute which will occur July 19-23. Topics may include polishing some of the RCEA kits, learning new engineering curriculum, design and planning time for incorporating new ideas into already full courses.